Erected 2000 by "People of Turtle Island". Location. 40° 42.093′ N, 84° 9.091′ W. Marker is near Lima, Ohio, in Allen County. Marker is on Shawnee Road, on the left when traveling north. Touch for map. This is located on the grounds of the Shawnee Township Cemetery, just inside the east entrance, to the right/north. Marker is in this post office area: Lima OH 45806, United States of America. Touch for directions. miles away); Johnny Appleseed Tree (approx. 0.9 miles away); Veterans Freedom Flag Monument (approx. 1.2 miles away); Mary Shafer (approx. 2.4 miles away); Solar Refinery (approx. 2½ miles away); The Shawnee Indian Reservation (approx. 2.8 miles away). Touch for a list and map of all markers in Lima. From the Lima News - July 11, 1999: A five-ton granite rock is what the local Native Americans have chosen to honor the Shawnee Indian Chief Pht. 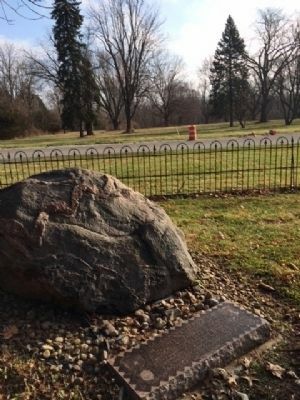 After months of waiting and anticipating, the stone is sitting at Shawnee Cemetery, just across the street from the chief's 168-year-old grave. "The rock is near the chief's grave, without being on private property," says Helen Spyker, a member of the Native American interest group, People of the Middleground. That group selected the stone, which they believe has special significance. "We were drawn to that rock because of the symbols on it. It's a powerful rock, fitting for a chief," said member Brenda Hawk. The granite rock has a rose quartz serpentine symbol across the top, and a turtle symbol facing the northeast. "Grandmother earth is the turtle, and that's a sacred symbol," explained Hawk. And for some, the rock contains even more symbols. "Some have seen faces in the rock; others have seen a medicine wheel," recalls Hawk. More. 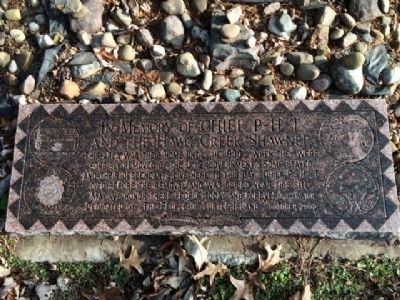 Search the internet for In Memory of Chief P-H-T and the Hawg Creek Shawnee. Credits. This page was last revised on June 16, 2016. This page originally submitted on December 10, 2014, by Michael Baker of Lima, Ohio. This page has been viewed 626 times since then and 20 times this year. Last updated on December 15, 2014, by Michael Baker of Lima, Ohio. Photos: 1, 2. submitted on December 10, 2014, by Michael Baker of Lima, Ohio. • Bill Pfingsten was the editor who published this page.